I am from Mason Ohio, that little known suburb of Dayton, Ohio. Since getting my MPX Pro in February of this year I have found a 1943 silver quarter. I am hoping to get out more once the weather turns warmer. Come on spring! Metal detecting is my newest hobby but it kind of goes along with my historical research over the years. With all of the “digging” the club does, I wished I had some heavy equipment to offer. The best you can hope for when I am using a shovel is a shallow hole. Fortunately, I hear that these are the kinds of holes that work best when metal detecting though. 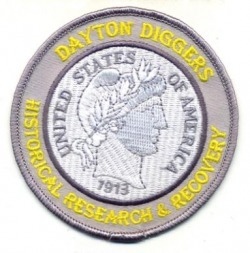 I first heard about the Dayton Diggers from the Buckeye Treasure Hunters Forum and decided to join a while ago. In addition to being a member of the Warren County Historical Society I am also the founder of The Ohio Ghost Hunters Association (T.O.G.A.). My interests also include paranormal investigating and treasure hunting. My kids are now members and we are all waiting for the Dayton Diggers Virginia Hunt!